Is Deontay Wilder the best Heayweight in the world? Wow!!!! I’m still a little stunned at what I just saw. Today is November 4th. The time is 10:51 central time. I just witnessed a 1 round destruction of Bermane Stiverne by Deontay Wilder. Wilder looked phenomenal tonight. He looked calm, composed and calculating. A lion stalking his prey. He pounced and pounced in a hurry. From the opening bell everything Wilder did had bad intentions written all over it. Even his jab looked mean. As I watched the fight I turned to my fiance’ and said Wilder looks like he wants to take him out. Which he did in violent dominating fashion. However it was how he went about the k.o. that impressed me the most. Given the heated trash talk and legitimate bad blood between the two men I expected Wilder to come out swinging from the outset. However Wilder started aggressive yet measured. Using a very powerful jab to set his tempo. Once you seen that Wilder had the range and timing figured out he went to work. Knocking down Stiverne three times before referee Arthur Mercante stopped the fight. The first knockdown came as a result of a beautiful straight right hand thrown right down the middle. The second knockdown was the result of an overhand right. The third and final knockdown was a barrage of punches that went unanswered as Wilder had Stiverne trapped against the ropes. From his mannerisms and body language in the ring to his confidence and swagger after the fight you just had a feeling this fight went exactly the way Wilder knew it would. 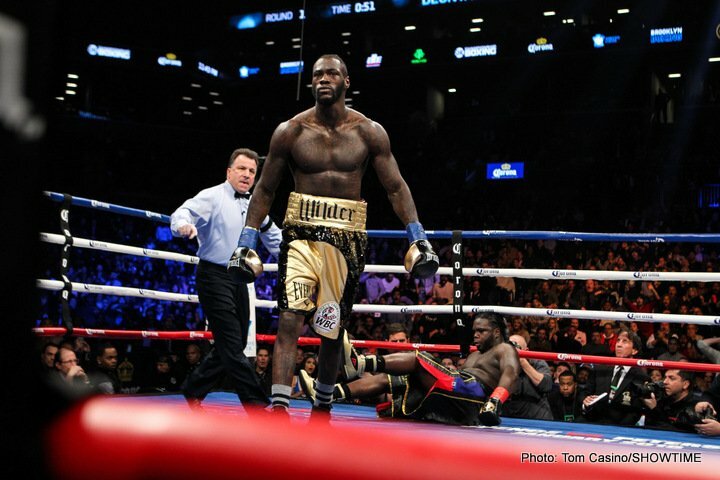 Although Stiverne took this fight on short notice and he did not look like he was in the best of shape. You still cannot take anything away from what The Bronze Bomber did tonight. Now we can all look forward to a super fight between Deontay Wilder and Anthony Joshua in 2018. Each man has his supporters and doubters going into that fight. Wilder has the better record however Anthony Joshua has the better resume. Although I have never seen Wilder look as composed focused and deadly as he did tonight. He came out with a purpose and accomplished it with frightening effect. We may be looking at the best heavyweight in the game today. They might have been the best performance from a heavyweight this year. A strong candidate for knockout of the year. Deontay Wilder is a very impressive physical specimen. No other heavyweight has that combination of speed and power. It is still far too early to predict who would win a fight between Joshua and Wilder. They haven’t even put pen to pad yet. Until then all we can do is speculate. However based off the strength of his most recent performance my early prediction is Wilder knocks out Anthony Joshua to stake his claim as the king of the heavyweight mountain. You are here: Home / Boxing News / Is Deontay Wilder the best Heayweight in the world?